The Blue Devils trailed 8-5 at halftime, but outscored the Colts 7-3 over the final 24 minutes. Robbie Smith led Huntington with four goals. The freshman has 18 goals and an assist this spring. Christian Mule led Hills West with six goals and two assists in the losing effort. Colts goalie Jake Zacharakis also played well in the game. He made 12 saves, stopping 50 percent of the shots he faced. Despite the wet weather, both teams enjoyed playing on the Hofstra Stadium turf field. The non-league victory improved Huntington’s overall record to 5-4 this season. The Colts overall record fell to 3-6. The victory was the second one-goal win in a week for the Blue Devils. Entering the game, Huntington was on a hot streak. The Blue Devils had won four of thier last five games. Catching passes, picking up ground balls, playing tough defense and “getting everyone involved” have taken on heightened importance as the Blue Devils drive to secure a playoff berth, Watts said. The Blue Devils are in the hunt for a playoff spot in Suffolk Division I. Huntington plays a non-league game at ColdSpringHarbor on Thursday night at 7 p.m. There are home games remaining with Lindenhurst, Southampton and Northport and away contests at Sachem North, Commack and North Babylon. Senior attackman Philip Polo rips a shot. He scored a goal for the Friars Tuesday against St. Ignatius. After suffering a 7-13 defeat against arch-rival Chaminade earlier this month, the St. Anthony’s varsity boys lacrosse team was looking to get back to winning ways Tuesday when they faced off against St. Ignatius. St. Anthony’s, a perennial Catholic High School Athletic Association powerhouse, improved their record to 6-1 with this week’s 13-10 victory. Junior faceoff man Jake Naso was dominant from the first whistle for the Friars. He won 21 of 25 faceoffs. His play helped keep the Friars on the offensive and limit St. Ignatius’s chance to build momentum. Senior captain Jake Bonomi and junior Brennan O’Neil, both attackmen, led St. Anthony’s with four goals apiece. Junior midfielders Aidan Danenza and Jack Walshe helped the Friars control the middle of the field and each scored a goal. Senior attackman Philip Polo also notched a goal for St. Anthony’s. Senior captain Greg Campisi, a long stick middie, provided leadership on both sides of the ball for the Friars. In addition to his defensive duties, Campisi scored a goal. In the cage, junior goaltender Alex Pazienza made seven saves. Pazienza has made more than 50 saves in seven games this season for St. Anthony’s. The Friars will try to stay undefeated before their second meeting of the season with Chaminade on May 15. 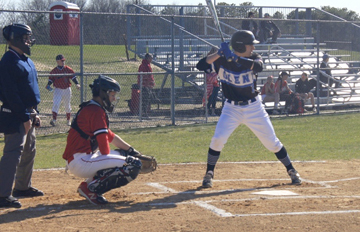 St. Anthony’s next game is scheduled for Thursday, April 18 at 4 p.m. at home against YorktownHigh School. Cold Spring Harbor hockey team membs and coaches pile in for a photo after winning the Nassau championship. The Cold Spring Harbor varsity ice hockey team glided into school history in February winning the program’s first ever County Championship. Coming out of a regular season that had a few bumps along the road, the Seahawks were amped up to show what they were made of during the playoffs. Their first game against Bellmore-Merrick was close, but the boys stuck it out and won 5-4. The Seahawks were down until the final period in their semi-final game against Syosset, but scored crutial third-period goals to win. Their final challenge was to beat Long Beach in a best two out of three series. Although the Seahawks had lost to each of their playoff opponents in the regular season, they beat each of them when it counted to end the season with a record of 17-4-1. Considine relied on the junior class many of whom had faced off against Long Beach at the Middle School Championship years before, as his core group. “They knew they could play with them, but they had to play a certain style and buy into it,” Considine said. Going into the county championships, the Seahawks planned to keep their front two lines fresh by consistently rotating in players. With a roster of 20 players, Considine felt his team had the depth to keep six strong players on the ice. “This was to make sure that when it came down to the wire, my top players weren’t exhausted like the other team was,” Considine said. The boys were able to build up momentum at the end of the season with a six game winning streak that carried them to playoffs. Considine found his team was at their best when they decided to come together and work cohesively to win. They could wear down opposing teams with their size and strength, but closed the deal with plays. The Seahawks were led by captain and the team’s point leader Colin Bertsch. He earned 38 points with 20 goals and 18 assists. He was aided by assistant captains Max Van Son, Peter Leonard and Harry Carswell. Goalie Griffin Iglesias anchored a solid defense. Iglesias played 656 minutes this season, allowing only 48 goals and recording a goals against average of 3.29. This united front allowed Max Van Son, Colin McHale, Owen Kaplan, Rich Straino and Riley Van Son to each score 20 or more points for the team. The Seahawks are unable to attend the State Championship this year, since last year they were invited but could not roster a full team, due to players’ other commitments. Looking forward to next season, Considine feels the Cold Spring Harbor ice hockey program will continue to thrive at all age levels. The school had one team with 14 players when he first began coaching 10 years ago. Now, the Seahawks have a modified, junior varsity and varsity team that has 60 players. Walt Whitman freshmen Gianna Paul’s 400m finish of 57.45 seconds qualified her for the national championships. Walt Whitman’s girls indoor track team is close to wrapping up its season, but still has one extraordinary runner racing her way to the state and national championships. This season saw the smallest team head coach Rufus Shepard has ever coached with only 22 girls, most underclassmen. Many individual athletes triumphed this season at meets, particularly Whitman freshman Gianna Paul. Joining the spring track and field team as an eighth grader, Paul broke the school’s record in the 400-meter run. Her time – 57.45 seconds – was a personal best that qualified her for the national championship. In her first year competing with the winter track team, Paul set a school record for the 300m dash with a time of 40.55 seconds and 600m dash with 1:39.66. She also competes in long jump where she set a 16’10” school record. Every day at practice, the coaches give runners a workout that conditions them for particular events. Shepard finds Paul is a very “self-motivated” athlete, who wastes no time getting through the drills, even doing extra if she finishes early. Paul will compete at the Long Island Elite meet this Saturday against the best runners from Nassau and Suffolk counties, as preparation for the state championship meet on March 2. She is a prospect to place within the top six for the 300m dash and earn All-State honors. Nationally, she has the ability to place within the top three for the freshmen 400m dash, her coach said. With a young team, Shepard selected sophomores Grace Weigele and Priya Katwala as his captains. He considers both strong leaders and motivators. Weigele also takes the spot as top distance runner. In the 3,000m race, she’s run a personal best 11:44. Standing out as the top jumper, Emily Gorecki has cleared 4’8” in high jump. Paul’s training partner, Jessica Doddo, excels in the 300m dash and the girls motivate one another, Shepard said. Many of the girls will keep track of their progress through “Distance Time Racing” that tracks their times and ranking. “I think this is a big motivation, because they want to self-improve, it’s all about looking at the numbers and getting better,” Shepard said. Overall, this season has been a time for the team to rebuild, work on technique and boost their stamina and endurance. Looking forward to the spring season, Shepard will be able to pick up where he left off with the team as the girls outdoor track and field coach, while gaining competitive athletes. Commack senior Joey Slackman, second from right, celebrates with his coaches after winning the 285-pound state championship on Feb. 23. Commack’s Joey Slackman won last Saturday the New York State wrestling title in the 285-pound weight class. Slackman, a senior, entered the state tournament as the top ranked wrestler in his weight class having won the Suffolk County championship earlier in February. He was returning to states with something to prove. He fell just short of the state title in 2018, losing in the championship match. Slackman pinned his first three opponents on his way to the finals where he faced off against Freeport’s Myles Norris. The match against Norris proved to be Slackman’s most difficult of the tournament, but the experienced wrestler earned a 4-2 decision victory and his first state title. “Winning in my senior year is the best feeling in the world right now,” Slackman said after the match. Slackman finished the 2018-2019 season with an impressive 46-0 record, and is planning to continue his wrestling career in college at the University of Pennsylvania. The Cold Spring Harbor boys basketball team will have a shot at the Long Island title after beating Malverne last Saturday in the Nassau Class B championship game. This is the Seahawks first time winning the Class B County Championship in school history. They were previously Class C county champions in 1995. The game was a hard-fought, back-and-forth battle between the top two teams in Class B. Head coach Jason Mercurio knew Malverne had a great team, but was confident his boys could defeat them. The Seahawks handed the Mules their only loss during the regular season. The Seahawks started the game strong and took a 15-9 lead in the first quarter. Each team scored 12 points in the second quarter, sending Cold Spring Harbor into the locker room with a 27-21 advantage at halftime. This season the team had a mission to play a better defense. “Our motto this season was, ‘Keep teams to 50 points or under and we’ll never lose.’ This was something we stressed and we held them to exactly 50 points,” Mercurio said. Cold Spring Harbor point guard and captain Thomas Milana opened the third quarter with two timely three-pointers to expand the lead for the Seahawks. Mercurio feels Milana had his best game of the season, scoring 14 points. Captain Aidan Adomaites played an important part in the Seahawk’s win as well, leading the team with 18 points. Malverne battled back from the 11-point deficit to tie the game at 47 with five minutes left in the fourth quarter. That’s when captain Jack Vavassis stepped up. Cold Spring Harbor would go on a 9-3 run in the last four minutes of the game to secure a 56-50 victory. Kip Dallaris hit a three-pointer for the Seahawks and scored nine points in the game, while Vavassis, Nick Suter, Luca Sanna and Steven Samuels rounded out scoring with six, four, three and two points, respectively. 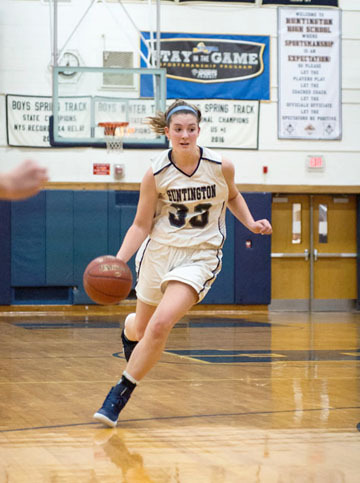 The Seahawks ace off against the Red Devils of Center Moriches at Farmingdale State College on March 6, 7 p.m. for the Long Island Class B Championship. A Huntington-based boxer is once again set to headline a fight at The Paramount when Star Boxing hosts the 34th edition of its “Rockin’ Fights” series. Johnny “Hitman” Hernandez, 27, of Huntington, is scheduled to make his 12th appearance in the ring at The Paramount next Friday in the co-main event for Star Boxing. Hernandez, 9-4, is set to take on Texan Marquis Hawthorne, 6-9, in front of the hometown Huntington crowd in the 140-pound division. Hernandez is the second boxer from Huntington to feature in the main event at The Paramount recently. Chris Algieri made his comeback to the ring during a Star Boxing fight at The Paramount in November. Joining Hernandez and Hawthorne at the top of the card will be junior heavyweight fighters Joel Djeko, of Belgium, and Italian Simone Federici. Djeko and Federici will rely on brute strength for victory, while Hernandez will rely on footwork and conditioning to defeat Hawthorne in the pair’s lightweight bout. The fight will be Hernandez’s second main event at The Paramount, and DeGuardia said he hopes the fighter can impress in front of the friendly crowd. Although Hernandez lost his last fight to Danny Gonzalez, he has a reputation for getting stronger as fights stretch into the later rounds. “In his last fight Johnny showed grit and we will always support our fighters, win or lose, when they perform like he did,” DeGuardia said. Hawthorne will not be easy to beat. He is coming off a recent upset over previously unbeaten boxer Ronnie Austion at Mohegan Sun in Connecticut. The undercard fights are scheduled to begin at 7:30 p.m., Feb. 22, and tickets for the event range from $50-$200. Tickets can be purchased at the box office or online at Paramountny.com. The Cold Spring Harbor boys varsity basketball team has dominated so far this season, holding a strong defense and picking up points through a united front. The Seahawks have a record of 17-2 this season and will face off against Oyster Bay in the Nassau Class B semi-finals this Sunday night at Farmingdale State College. Head coach Jason Mercurio feels his team is “battle-tested” after coming out victorious against challenging teams. The team started off the season playing against tough non-league teams to prepare for a fiercely competitive league. Although there is no league championship game, Cold Spring ranked second in their league after Malverne. The Seahawks finished their season strong with a big win against Malverne in their last game, handing the Mustangs their only loss of the season. Mercurio attributes his team’s prosperity to the positive attitude his captains and players have during practice. In previous years, the team’s “Achilles’ heel” was stopping the opposing team’s offense from scoring. Many of the team’s seniors witnessed the issue first hand, and they made it a priority to improve. “Our team has made a commitment to playing better defense, which has been a goal since the first day of practice,” Mercurio said. This year, the Seahawks were ranked one of the strongest defensive teams in the county. Mercurio credits captain Jack Vavassis for leading the improvement and considers him to be the “anchor” of the team. As a guard, he demonstrates his “incredible” skill by defending opposing team’s best players and securing many rebounds. Fellow captains Nicholas Suter, a three year veteran of the squad, Aidan Adomities, a three year starter, and Thomas Milana a two year veteran, use their experince to lead the team. They’ve each seen many playoff battles, and know what it takes to keep the team calm during stressful situations. Sophomores Kip Dallaris and Luca Sanna have stood out as strong players at a young age and earned themselves solid gametime. Although ten of the team’s players are seniors, Mercurio feels his team will remain powerful in coming years with young talent. In his six years coaching at Cold Spring Harbor, Mercurio has an overall record of 82-37. He’s built the team from the ground up , and since then has made vast improvements. He said he feels proud of this accomplishment, especially since his record in his first two seasons was 18-18. In preparation for the big game on Sunday, the team has been watching and critiquing film from their games against Oyster Bay. During the regular season, each team won one game and Mercurio feels Sunday’s game will be a “good battle”. The players’ biggest focus will be handling and moving the ball to one another, to set up the best shots possible. If the team wins on Sunday they will move on to the Nassau Class B Championship, but Mercurio said the Seahawks aren’t looking too far ahead. Posing with the brackets showing their path to the title, Elwood-John Glenn wrestler, from left, Patrick Ancewicz, Justin Vega and Thomas Giaramita are Suffolk Division 2 champions. 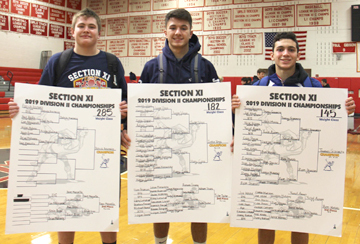 Wrestlers from high schools around the Town of Huntington found success on the mat last weekend during the Suffolk County Section XI Championship. The smaller schools in the county competed in the Division 2 tournament last Friday night. Elwood-John Glenn was the only school from the Huntington area to qualify for this division. The Knights had an impressive showing as a team; they racked up a total of 227.5 points. The total was good enough for second place out of ten. Four individual wrestlers made it into the final match in their respective weight classes, and three Knights earned gold medals. In the 99-pound weight class, Glenn’s Anthony Mirando fell just short. He lost in the championship match to Blue Point’s Max Gallagher after an impressive run of victories to reach the finals. At 145-pounds, Thomas Giaramita was the first Knight to secure a Suffolk County title. He pinned Ryan Shanian from Mt. Sini high school after five minutes and 29 seconds. Justin Vega also managed to pin his opponent in the championship match. Vega ended Port Jefferson’s Harry Cona’s run at the title after just 1:14 in the 182-pound division. For Glenn’s Patrick Ancewicz the championship match proved more difficult. He was locked in a close battle with Aldar Molina of Center Moriches for the entire contest. The two heavyweights fought hard for the 285-pound title. Ancewicz prevailed by a score of 3-2. Commack senior Joey Slackman celebrates after winning the Suffolk County championship in the 285-pound division. There were eight schools from the Town of Huntington competing in Suffolk’s Division 1 tournament on Feb. 9-10. Commack finished top of the pack, and in fourth place overall, with a score of 104. They were followed by Huntington, 45.5, Northport, 45, Half Hollow Hills East, 37. 5, Half Hollow Hills West, 21, Harborfields, 20, and Walt Whitman, 12. The Cougars had several stand out individual wrestlers who helped the team reach a top five finish. Junior Jack Echerle finished in second place for the Cougars in the 113-pound division. He suffered an 8-2 defeat in the championship match to Hauppauge’s Luke Smith. At 126-pounds, another Cougar fell just short of the county title. Junior Gavin Damasco lost to Zach Redding of Eastport-South Manor by a score of 11-1 in the final match. Commack’s top wrester, and one of the best performers of the tournament, was heavyweight Joey Slackman. The senior showed his experience, dominating the 285-pound division. He capped of his championship run with an impressive pin against London Castillo of Brentwood in just 36 seconds. In addition to his Suffolk title, Slackman earned the honor of most pins in the least amount of time. He managed to pin four opponents in just 3:22. 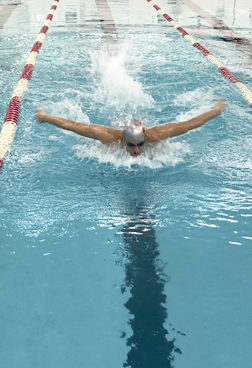 The Thunderbirds of Half Hollow Hills High School East also can claim a county champion among their ranks. Senior Jonathan Spadafora won the 145-pound weight class in style with a 10-1 major decision over Newfield’s Hunter Hughes. Northport’s Peter Magliocco has plenty to be proud of after a good run in the 195-pound division. Magliocco, a junior, lost in the finals by a score of 6-3 to Liam McIntyre from Westhampton Beach. Rounding out the medal winners from the Town of Huntington was Blue Devils junior Tazadon Smith. He pinned Centereach’s Christopher Powell in 1:20 to claim third place in the 220-pound weight class. The county champions will wrestle for the state title in Albany beginning on Feb. 22. Sophomore Isaiah James runs the second leg of a relay. He won the 1000m at the Suffolk County Sophomore Championship and was the runner up at the League III Championship. The Huntington indoor track team have found victory this season and aren’t looking back as they race to the County and State Championships. The Blue Devils will advance to the County Championship after winning the League III Championship on Jan. 19 with 97 points. Huntington’s athletes have had remarkable races and events at weekly tournaments. Coach Ron Wilson has led his Blue Devils against schools from across Long Island, New York and the North East to prepare them for future meets within their area. “You have to get them out there to get exposure and experience... 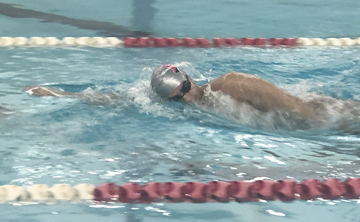 The experience they get at meets is to push themselves, you push them hard at practice, but it’s nothing like the experience at a meet,” Wilson said. The team’s 4x400m and 4x200m relays rank first on Long Island and second in New York State. At the recently Ocean Breeze Invitational on Staten Island, the 4x400 team placed first at 3:20.89 and the 4x200 was edged out by about one second for the championship with a time of 1:31.41. Wilson also brought the team to the Dartmouth Relays in New Hampshire, the “height of competition” with over a hundred other schools vying to win. “It’s a rugged meet and it’s tough to do well there because of the conditions and the competition is great up there… Placing in the top 10 means you’re gonna do well when you go back to your own section. We placed third,” Wilson said. Senior captain Eric Sands dominates shot put and weight throw for the Blue Devils. Sands set a personal best at the Ocean Breeze Invitational with a shot put throw of 49-06.00 and placed ninth throwing weight a distance of 45-02.50 feet. Senior Jaden Bholan is a top high jumper, reaching 6 feet 3 inches. Sophomore Trevan Meagher clears 5'10" at the Ocean Breeze Invitational. Senior captain Jonathan Smith is one of the best runners in the nation for the 300m, 500m and 600m races, and his efforts have shown on the 4x200m and 4x400m relay teams. Smith has been on the team since eighth grade and witnessed them win the National Championship in 2016. 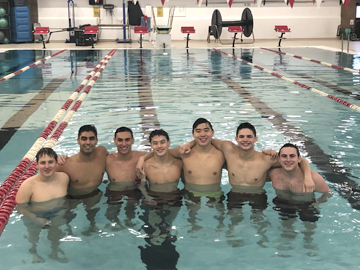 This season the team has a majority of underclassmen who Wilson feels are “full of talent.” His relay teams are a rotation of runners, many of whom are underclassman, including captains Nasir Youngblood, Smith, Isaiah James and Justin Stevens. CJ Kiviat, Anthony Joseph, Josiah Melendez, Jason Turner and Jahmar Francis also feature heavily in the Blue Devils relay teams. James, a sophmore, has stood out in the 1000m run, winning first at the Suffolk Frosh/Soph championship and becoming runner-up in the league with a personal best of 2:40. Kiviat, a sophmore, has proven to be one of the best middle distance runners in Suffolk County, capturing the League III 600m title with a time of 1:24. At Suffolk’s Frosh/Soph Championship this year at Brentwood, Huntington’s freshmen and sophomore boys excelled, accumulating the most combined points of any team. The next challenge in the Blue Devils’ journey is to triumph at the Large School County Championship in February. From there, athletes will have the opportunity to qualify for the State Championship at a state qualifier meet. Huntington High School has some of Long Island’s brightest track and field stars, including senior Johnathan Smith, one of the top high school runners in the country. Smith capped off another incredible day of performances by winning the gold medal in the 600m run last weekend at the 2019 Freedom Games at Ocean Breeze Athletic Complex at Staten Island. Smith’s first place time of 1:21.61 set a new Freedom Games meet record and ranks him first over all in New York State and second in the United States this winter in the 600m run. Over the weekend Smith also improved his rankings in the 300m dash to Long Island number one, New York number three and 11th in the country with a third place finish in 34.98 seconds at the Freedom Games. Only three other Blue Devils have ever dipped below 35 seconds in the 300m dash. Smith’s time is the fourth fastest ever by a Huntington athlete. Kyree Johnson (33.85 seconds), Lawrence Leake (34.65 seconds) and Y’Majesty Allen (34.80 seconds) hold the top three spots in Blue Devil history. In the field events, Huntington senior Jaden Bholan is among the best high jumpers in the state. Bholan is ranked number three in Suffolk, fourth on Long Island and number 10 in New York State in the high jump this winter. The Blue Devils star cleared a height of 6-03 feet earlier this season to put him among the top athletes in the event. The Blue Devils will look to continue their dominance on the track ahead of the state qualifying meet at St. Anthony’s High School on Feb. 11.